A common problem for most popcorn machine operators is how to effectively and safely clean the outside of their kettles, especially if oil has burned onto the outer shell and has sat for an extended period of time. 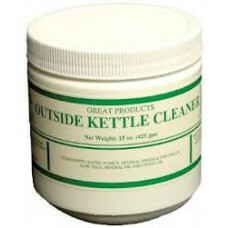 Our industrial strength Outside Kettle Cleaner paste, will remove all unwanted residue from outside of your kettle, each and every time. Heavy-duty cleaning and degreasing of the interior kettle surface without damage or scratching. Regular use will extend the life of your kettle and provide more efficient operation. A clean kettle makes for better tasting popcorn.